Fly ash by fly ash weighing hopper of the weighing system, pneumatic butterfly valves, sensors, etc. Pulverized coal DE whole sealing device for the weighing, weighing hopper through three sensors weighing. Weighing hopper is driven by strong typical pneumatic butterfly valve door. Zhengzhou CamelWay Machinery is one of the large-scale enterprise specializing in construction machinery for several years. 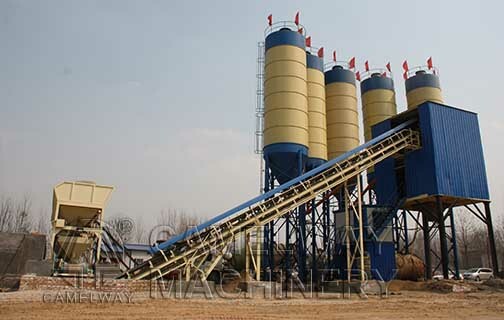 The company can provide HZS25, HZS35, HZS50, HZS60, HZZS75, HZS90, HZS120 and HZS180 concrete batching plant. If you are interested in it, please feel free to contact us at any time. This entry was posted in Brazil Batching Plant, Solution and tagged concrete bahcing plant, Concrete Batching Plant by camelway. Bookmark the permalink.